Do you sometimes struggle with making decisions, held back by the fear of choosing the wrong path or action, and then end up taking no definitive action at all? Or have you ever tuned out that quiet inner voice within telling you to do something (or not do something), and then felt regret later? The fact is that the decisions we make are within our power, and they are choices that will have a very real impact on the results we generate in our lives. This can be an overwhelming thought at first because of course we always want to believe we are making the right decisions to create the happiest lives possible… even if some of the long-term outcomes of our choices remain unknown! But the great news is that each and every one of us is born with six mental faculties we can use to navigate the world and create the lives we want to live. The six mental faculties are intuition, imagination, will, reason, memory, and perception. While these six mental faculties all work together, the mental faculty of your intuition specifically can unlock your ability to make decisions aligned with the life you dream of having. So what exactly is your intuition? You know that feeling when something just “smells fishy,” or when you can read a person’s mood without them saying a thing? This is your intuition at work! It knows things that your logical, rational mind simply can’t. It’s wise to listen to your intuition, because it has a lot to say and it can help you make good decisions – the best decisions – to manifest results and create a the life of your dreams! And now, here are six proven techniques for developing your intuition so that you can make good decisions that move your life forward. Next, notice the ways your body is satisfied by your choice. Now, this doesn’t mean that you will order, decide on, or receive exactly what you want every time. We can’t live entirely on cheeseburgers and milkshakes, after all! But this exercise will help you practice listening to that voice within that helps you make decisions based on love instead of a sense of obligation, fear or shame, which will provide you more satisfying results. When you’re faced with a relatively minor decision, give yourself what you believe to be a reasonable amount of time to make the decision, and then stick to it. This will help you avoid over-analyzing and expending your precious time and energy weighing options and making pro-and-con lists (which of course can be helpful for high stakes decisions). Allow yourself to simply answer to your gut quickly, instead of letting your intellect and logic expend more time and energy than necessary to make a decision. Listening to and nurturing your creative urges is one of the best ways to tap into your intuition in a fun and fulfilling way. If you like to paint or dance or play piano, even if you don’t do these things professionally (or even very well), try doing them and see how you feel moved and inspired on a level that transcends logic. Try making a creative impulse an everyday habit, however brief, and see what new feelings, insights or answers seem to come to you magically! We all need human interaction to build interpersonal connections and nurture our deepest selves, but likewise, we also need time alone to connect and reflect with our own inner wisdom. When we are constantly surrounded by the chatter of other people’s thoughts and opinions, our own intuition can get drowned out, creating confusion and muddying our decision-making. One way to stay connected to your still, small voice within – to your inner wisdom – by spending some time alone (and without the distraction of technology!) deep in thought. The more often you make room for stretches of solo time, the more quickly and meaningfully you’ll be able to call upon your intuition when you need it. Constrictive emotions like anger and stress can block your ability to tune into your intuition. So when you notice that you’re having impulses like these, take a pause, take a deep breath, and shift your thoughts and feelings toward something that feels better for you. Remember that you always have this choice! Positive, empowering and expansive emotions nurture your intuition and build a more positive relationship with your inner voice, which will help you trust it more readily over time. By writing your thoughts and feelings down in a journal, you are giving them attention and opening a gateway for intuition to speak to you. Don’t focus on how much you write or the quality of your writing. You don’t have to be a professional writer by any means! Just write what comes to you and then you can reflect on it. Journaling works best if you do it regularly, so set an intention (and a timer if necessary) to journal every day for a few minutes. You will begin tapping into your deepest thoughts and feelings and sharpening your intuition in the process. Above all else, learn to trust and honor your inner voice. Believing you can change, learn, and grow is part of having a growth mindset, so when you have a gut feeling or a hunch about something, start following it and making decisions based on it. Once you learn to put faith in your intuition, you’ll start relying on it regularly. Do this and over time, you’ll start to see a correlation between following your intuition and generating the results in life that you desire. The better able you are to tap into your intuition, the more aligned your decisions will be with a life you’d love… and you’ll be well on your way to manifesting your dreams! And now, here’s a free gift that will help you build your muscle when it comes to tuning into and following your intuition! 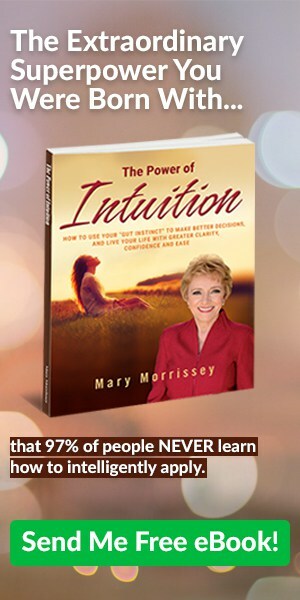 For more proven ways to fully harness the full power of your intuition, so that you can use your “gut instinct” to make better decisions, and live your life with greater clarity, confidence and ease, click to download my FREE ebook, The Power of Intuition. The 6 invisible superpowers we are all born with (including intuition!) that, when intelligently applied, will empower you to be, do, have and give what it is that you would truly LOVE in this one precious life of yours. How to recognize the voice of your intuition amidst all of your other mental chatter, so that you can tune into your inner guidance system, and follow its infallible guidance much more easily. 9 proven ways to develop and hone your intuition, so that you have all of the information you need to make better decisions that are more aligned with what you would love to create for yourself and your life. Download your FREE copy of my ebook, The Power of Intuition now. 9 times out of ten you’re gut is right on. Thanks a good read. I’m looking former more positive reads this was insightful and educational.